The Detox Summit -- FREE to register, all online! I just got word about an amazing opportunity not just for all Lymies and people with chronic illnesses, but for anyone who is interested in learning more about anything and everything related to detoxing. I can barely calm myself down enough to type this post--I&apos;m so excited to share this information with you all! Again, this online program (The Detox Summit) is online and FREE, and will be going on August 4-11, 2014. All you have to do to is go HERE, type in your first name and your email, and you&apos;re all set to attend this wonderful online opportunity! "The compilation of 30 experts in various areas of medicine, nutrition, and personal growth are what make this Summit unique, offering a well-rounded, credible approach to a much-debated issue. Learn to navigate your way through I day&apos;s toxic terrain by recognizing toxins, what to do about them, and how to change your life into a healthier you!" Mark Hyman, MD, Best-selling author and one of the most widely recognized, and respected, names in functional medicine today. Kelly Brogan, MD, Board-certified in Paychiatry/Psychosomatic Medicine/Reproductive Psychiatry and Integrative Holistic Medicine. Aristo Vojdani, PHD, MSC, CLS, Professor of Neuroimmunology at the Garrick Institute for Graduate Studies; Chief scientific advisor for Cyrex Labs, LLC. JJ Virgin, CNS, Author, Fitness Expert. And that&apos;s just a sampling--there are so many more wonderful experts on this list! And there&apos;s so much more that will be covered that I simply don&apos;t have the space to type it all in this post. Just trust me, this is good stuff and will be worth registering--after all, it&apos;s FREE. Food & Spirit Nourish Your Whole Self™ Report by Deanna Minich, PhD. "This booklet gives you a unique approach to food and eating using a combination of modern science and ancient traditions. You will learn how foods connect to seven aspects of yourself: your body, emotions, power, heart, voice, mind and spirit." Detox Your Medicine Cabinet: 26 Herbs and Supplements that Treat Common Symptoms by Aviva Romm, MD "It’s time we rethink our medicines. Cleaning out your medicine cabinet isn’t just about getting rid of expired meds that might be hazardous to someone in your household if accidentally ingested or that have had an FDA recall–although these are good reasons–it’s about ending over-reliance on common but potentially unsafe medications. What’s great about herbs and supplements is that many serve more than one purpose, and some are even common kitchen ingredients!" Top 7 Therapeutic Foods by Kelly Brogan, MD "Learn about the Top 7 Therapeutic Foods you should be eating as well as why you should eat them! There’s even a bonus for each one to show you how to work them into your diets! Enjoy this creative but useful booklet!" Ten Tips for Helping Your Loved One with Autism by Martha Herbert, MD, PhD "This is a message of hope and empowerment for every family and person with autism who wants the best for their children or children they may dream of having. Take these tips to heart and savor the gains!" Benefits of Vitamin D by Soram Khalsa, MD "Vitamin D is so important to our health that it’s vital to know the benefits of it in your life!" Seriously, this is such an amazing opportunity I had to share it here immediately! I'm already registered and I hope some of you will seize this chance to learn everything you ever wanted to know (and possibly more) about the ever-so-crucial element of life--detox! I've yet to meet a fellow Lyme patient who doesn't experience light and/or sound sensitivity to some degree. Sometimes these sensitivities are so severe they interfere greatly with everyday life; sometimes they're just annoying enough to make us squint our eyes or cover our ears with our hands for a moment or two to recalibrate and calm our minds. The spectrum of outside stimuli that can trigger a negative reaction vary, as well. There are obvious triggers like sudden bursts of sound (e.g. fireworks, sudden volume increases on the TV, police sirens) or light (e.g. overhead fluorescent lighting, sunlight reflecting off of snow or coming through a car window, action movies with lots of flashy scenes), and there less obvious triggers that seem harmless enough to an average, healthy person, but can send a person with light/sound sensitivity into a downward tailspin (e.g. the sound of a clock ticking, soft background music, the screen of a cell phone). Most often, as with all Lyme-related symptoms, the severity of these sensitivities can wax and wane--meaning, they could be so intense on one day that all you want to do is hide in your bedroom, completely hidden under your comforter, and the next day they could be tolerable enough you're able to go out into the "real world" with minimal difficulty (as far as the light and sound sensitivities go). For some people, though, myself included, these symptoms stay at a very intense level for a long time, and persist until treatment is well under way or has been completed. Which makes complete sense, because we know the attack of the Lyme spirochetes is non-discriminatory--they make their way into every single tissue in our body, including all the muscles/organs/nerves, etc. associated with our eyes and ears--and only by treating Lyme and any co-infections (the underlying causes) will we get long-lasting relief from the symptoms. In the meantime, though, I wanted to share some of the things I do to manage/cope with light and sound sensitivity, in hopes that some of you may also find them helpful. Even Lucy InTheSkyWithDiamondsMae understands how helpful sunglasses can be. This one probably seems like a no-brainer, because many of us already have a trusty pair of sunglasses we can pull out at a moment&apos;s notice if the light around us starts to bother us, but I wanted to mention a couple specific things that have helped me get the most effective help with sunglasses. If you wear prescription glasses, but don&apos;t have prescription sunglasses, I recommend looking into purchasing a pair if you&apos;re in the market for one. I know at traditional doctors and eyewear stores, even if you use insurance, an extra pair of glasses is never cheap, so if you&apos;re on a smaller budget (which, lets face it, money&apos;s an issue for nearly all of us with Lyme & Co due to treatment/doctors visits/supplements, etc), you could take your current prescription and check out sites like Coastal or Zenni Optical for great prices on glasses and lenses. If you don&apos;t wear prescription glasses, or if you always wear contacts/dont have to wear glasses all the time, I recommend purchasing a pair or two of non-prescription sunglasses from whatever store you prefer. One thing I would definitely recommend, though, is that even if you&apos;re buying non-prescription sunglasses, find sunglasses that have polarized lenses. It&apos;s easy to skip over the polarized lenses if they&apos;re On display near non-polarized sunglasses, because the polarized lenses will add a little on to the price, but I&apos;ve seen some really good non-rx polarized glasses on sale for $10-15, and I&apos;m telling you, your eyes (and brain) will thank you immensely for the extra protection. You also tend to see a clearer picture through polarized lenses, even with the stronger protection. I also recommend getting glasses that comfortably cover your entire visual field (so no matter where you look, your eyes are shielded). I personally prefer having my "movie star" sized sunglasses to wear most of the time, and my $10 wayfarer-style sunglasses to wear if I&apos;m having to lie down/wear a right hat (the huge lenses of the movie star sizes glasses make both of those things impossible to do, so I made sure I invested in a backup pair. Another commonplace thing that, for some reason, I didn&apos;t think about using in every day life until last December. Sure, we all can plan ahead and take earplugs with us if we know we&apos;re going somewhere noisy--like our trip to NYC to see a doctor last September--but how often do you get annoyed at a little (or big) noise in your day-to-day activities and try to telepathically (or audibly, if you talk aloud to inanimate objects like I do) will the sound to disappear, without even thinking about earplugs being able to help? I know that was the case for me until about 8 months ago. I don&apos;t remember what the catalyst for purchasing a box of earplugs was at that time, but it was one of the best decisions I&apos;ve made. I now wear the earplugs every night as I&apos;m in bed, which has not only significantly improved my ability to sleep, but has helped my mind not get distracted by outside noises (Roger breathing, Lucy scratching or snoring, cars driving down out street, etc. ), which then means I&apos;m able to relax/decompress more easily as I try to drift into dreamland. But ear plugs aren&apos;t just for use at bedtime. I never leave the house without having my ear plugs with me (they came with a case, but you could put them in a baggie or anywhere else convenient), because it&apos;s impossible to predict exactly what, when, or where sound sensitive-reactions will occur. Since I carry them around with me, anytime I find myself in a position where I&apos;m overwhelmingly sensitive to the sounds/noises around me, I put then in ASAP. I personally have a brand of foam earplugs that are contoured to expand with the shape of your ear for maximum sound reduction (you can find these at any major retailer), but there are all kinds of options out there. Experiment to see what works for you and I promise it will be worth it! On the 4th of July (and for about a week on either side of the holiday), our neighbors set off fireworks. LOTS of fireworks. And fireworks, with their unpredictable blasts, have an uncanny ability to send those of us with sound sensitivity into a major state of anxiety and skipped-heartbeats. On the first night of fireworks, as soon as I heard the first explosion (and screamed and mentally jumped out of my seat), I immediately put in my trusty earplugs. Imagine my surprise when the earplugs gave me little to no protection against the barrage of explosions outside my house. After being reduced to tears and ending up in the fetal position with my hands pressed hard against my ears/earplugs, I had an idea: I got out my headphones (I got a pair of Beats headpones for Christmas last year, but any over-the-ear headphones that fit well should work) and put them on over top of my earplugs. The degree to which this combination lessened the intensity of the firework burts was unbelievabe to me. On the actual 4th of July, there were more fireworks and louder explosions than the other nights, so that night I actually played music through my headphones while I wore them over top of my ear plugs, and that helped a lot, as well--with the music I knew what was going on, so even though it was still sound, it wasn&apos;t at all like the unpredictable, anxiety-provoking blasts of the fireworks. Headphones could also be used by themselves if there&apos;s just one particular noise that&apos;s causing you trouble. And they&apos;re possible the most customizable item on this list because it&apos;s completely up to you to decide what (if anything) you want to play through your headphones to help you deal with sound sensitivity issues, whether you go with classical music, nature sounds, guided relaxation exercises, pop music, throwback jams, or any number of other options (including not playing anything and just letting the silence calm your mind). Just because something is a common, every day item doesn&apos;t mean it can&apos;t be used in various ways to help us cope with issues we face while fighting a chronic illness. I don&apos;t think a day goes by where I&apos;m not glad we made this investment. And just because that was a double negative, to clarify: this was such an excellent investment! Many of us who are fighting Lyme & Co&apos;s know what it&apos;s like to be bedridden, whether it&apos;s for one full day, one week, one month, or several months and/or years. I joke with my family that my bed is truly my BFF. I mean, I probably spend more time in the company of my bed than I do with any other being/inanimate object on this earth. That&apos;s just my reality right now as I continue to travel this journey of treatment, supplements, healing, and trial and error, so I&apos;ve learned to be okay with it. But regardless of how comfy my bed is, there were other steps we had to take to make our bedroom a place where I can sleep/get away from light and sound whenever the need arises. Often, this is in the middle of the day, because as any Lymie will tell you, we all suffer from "Lymesomnia" to some degree (many of us can&apos;t even remember what the phrase "a good night&apos;s sleep" means), which leaves us awake throughout the night but desperately needing to sleep during daylight hours the following day, which is hard enough for a "regular" (aka healthy) person, and near-impossible for someone who deals with light sensitivity. Blackout curtains have been a major help for me in those situations, blocking out all light coming through my bedroom windows at any time of day. Even if it&apos;s a day where I did sleep at night, if I&apos;m having a light-sensitive day I&apos;ll still keep the curtains pulled to help reduce my headache, eye pain, anxiety, and sensory overload and help me just take time to breathe and relax. It&apos;s easy to put off purchasing blackout curtains because they sound like they could be expensive, but Roger picked ours up at WalMart (they have a few different options and they were very reasonably priced, meaning, not expensive at all), and they&apos;ve been such a big help to me without draining our bank account. And before I forget, I want to give a quick shout-out to Christina over at Lady of Lyme for mentioning blackout curtains to me over a year ago--I don&apos;t know what I&apos;d do without them now! There are even several tutorials on Pinterest about making your own blackout curtains, so if you&apos;re more of the DIY-type, or if you&apos;re looking for a project to do on days when all you have is time to spare, check them out HERE. With those components, there&apos;s no viable argument that can be formed against this product. I mean, hoodie + pillow = comfort to the max. It&apos;s that simple. In all seriousness, though, the HoodiePillow is one of my favorite products in existence when it comes to dealing with light/sound sensitivity. The HoodiePillow is a pillow case with the following modifiers: it&apos;s made of sweatshirt/hoodie material, it has a drawstring hood that comforably fits over your head when your head is on the pillow, it has a hole specifically for cords of any kind (headphones, phone chargers, etc. ), and it has a little pocket to hold any electronic device you&apos;re using (up to the size of an ipod/smartphone). 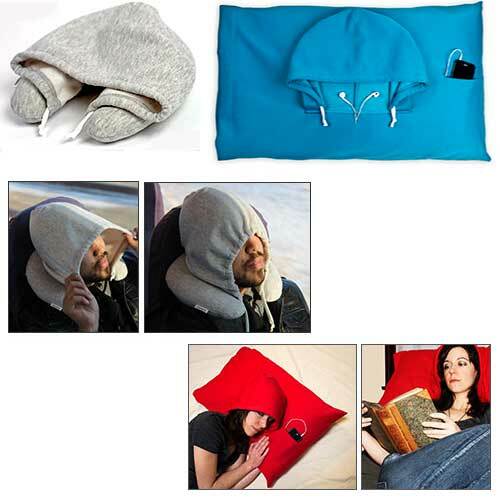 There is also a Travel HoodiePillow (one of those U-shaped neck pillows), which doesn&apos;t have the hole for electronic cords or the pocket to hold them, but the hood is promoted as being plenty big enough for headphones to fit underneath if you wanted to use them. It also includes the travel pillow itself, which is inflatable, making it easy to compress and stow away when you don&apos;t need it--and saving space is always good! Both of the pillows come in 5 colors: Black, Heather Gray, Ocean Blue, Fire Red and Lipstick Pink. The Hoodie Pillow was hands-down one of my most useful/favorite gifts I was fortunate to receive for Christmas last year. On days when my light sensitivity is acting up, I lie on my bed with my Hoodie Pillow covering my pillow, I pull the hood down far enough that it covers my eyes/ears and I pull on the drawstrings so it closes as tightly as is comfortable, blocking out as much light as possible (this works doubly well if I combine it with my blackout curtains). The Hoodie Pillow also helps with sound sensitivity to a degree. Obviously, since it&apos;s just sweatshirt material, it&apos;s not soundproof, but the combination of shutting out light and having it cover your eyes and ears still helps take the edge off of a mild sound sensitivity episode. If you combine the Hoodie Pillow with ear plugs, I think you&apos;ll be pleased at the reduced level/intensity of external stimuli. The Hoodie Pillow is also great to use after a night of insomnia, making it easier for you to catch up on sleep during the day, due to its ability to shut out light. "Mom, this is significantly less fun than chasing a laser. Stop making me model stuff just so you can show me off on your website." Another "common sense" measure I didn&apos;t think about taking until about 7 months ago. I grew up thinking that sleep masks were only for people who were so worried about their appearance they always stressed about getting plenty of "beauty sleep," which was an inaccurate assumption, yes, but a logical conclusion for a kid/teenager who had access to TV, movies, and books, becuase that&apos;s how sleep mask wearers are portrayed in popular culture. Several months ago, I was trying to come up with a list of every possible product in existence that was both convenient to use and could help block light from my eyes. Okay, maybe "every single product in existence" was an exaggeration, but only because one of the first products that came to mind, and one of the first products I tried, helped quite a bit--a good, old-fashioned, sleep mask. Of course, there was a hot pink option in the store (I actually got this one at Whole Foods), and of course I had to buy it, because if pink is an option, it is the only option in my book. The mask has a kind of satin-y feel to it, and is fairly cushiony with an adjustable elastic band to go around the back of my head. The band is actually dual-purpose--since I can adjust the pressure, I&apos;m able to make it fit snugly enough to help with daily headaches (not light/sound related, but an added bonus), but the mask itself blocks out light to such a degree that if I keep my eyes closed and the mask on, I wouldn&apos;t be able to tell you if it were night or day outside. The mask I have actually has a little extra padding in the under-eye area, which helps make the light-proof seal even better. I also use this mask in combination with ear plugs if it&apos;s a night where Roger needs the TV on in the bedroom (TV helps him fall asleep, but it keeps me wide awake and makes headaches and eye pain worse). He can have the TV on and the volume turned up enough to hear it clearly, and once I put on my mask and put in my earplugs, I&apos;m typically able to tune it out pretty well (the exception being a night where my headache/eye pain/light and sound sensitivity is severe, in which case he doesn&apos;t turn the TV on, anyway). So there you have it, my list of go-to solutions when my light and sound sensitivities are a problem. If I&apos;m being completely honest, at this point in time, I have to use at least one of these methods every day, but instead of being discouraged that these particular symptoms have yet to improve for me, I&apos;m thankful God has given me the resources to discover these helpful remedies. If you struggle with light and sound sensitivities and are looking for ways to get relief from, or function as normally as possible despite, those sensitivities, give one of these methods a try! I&apos;d love to hear from any of you who try these (hopefully with success!) or who have your own go-to solutions for dealing with these issues! Treatment updates: DesBio series for EBV and how intense treatment for systemic candida/yeast is a necessary evil. The Alpengeist is my favorite roller coaster of all-time. 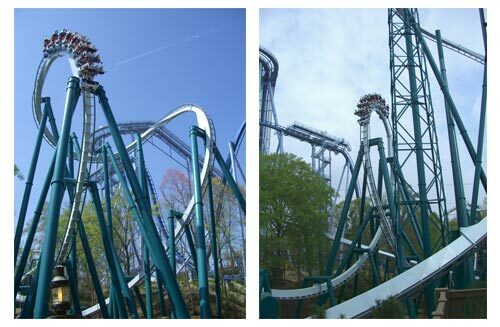 Now, I haven't ridden the Alpengeist since the summer of 2000, but during that trip to Busch Gardens in Virginia, shortly after the Alpengeist first opened, I'm pretty sure my dad and I rode it at least 5 times. At one point in time, the Alpengeist held the title of the world's tallest inverted roller coaster, with its first loop being a 106-foot vertical loop and then including 5 other inversions (loops, corkscrews, and the like). I have no idea if it still holds that title with all the new coasters that have come about in the past 14 years, but the Alpengeist will forever be my favorite because it was an exhiliratingly smooth breakneck speed ride (and, okay, it has the nostalgia factor going for it, big time). That was back when I loved roller coasters. That was back when I could ride roller coasters. (That was back when I could ride across town in a car without feeling sick, but I digress). The track is lime green, and I still have yet to get sick of the wordplay (lime/Lyme). Deja Vu is a cool name, but also a pretty perfect description for the day to day life of someone living with Lyme & Co's. Life with Lyme & Co's is nothing if not a roller coaster ride. I'll admit, the roller coaster ride that is Lyme & Co's is nowhere near as fun as the Alpengeist was all those years ago. Honestly, you'd be hard pressed to find any Lyme warrior who thinks this roller coaster is particularly enjoyable, because it's definitely not. It's a constant cycle of ups and downs, emotionally, phsycially, spiritually, socially. After a while, yeah, you learn to accept the cyclical unpredictability as reality, but that doesn't necessarily make it any easier to deal with it. As with roller coasters, I've noticed some of the hardest times I have (the lowest drops in the coaster of life with Lyme) tend to come after the higher points, just when you think you're gonna be able to coast on the track for a while, and I know many other Lyme fighters will tell you the same. For instance, I am officially halfway finished with my second round of my EBV treatment. The entire first round (February through May) I herxed majorly for a few days with every single dose (I was, and still am, on a 5-day dose schedule). I'm talking in bed, unable to move/eat/drink, crawling to/being carried to the bathroom, then back in bed to repeat the process in a few hours, and that was with every dose of the first round of treatment. Then I'd have a couple decent days before I took my next dose. This second round of EBV treatment has been much easier as far as the herxing goes. With the exception of the first 2 doses (I've now had 10 of the 20 in this round--still doing half-doses), I honestly haven't noticed much EBV-specific herxing at all (ie. debilitating fatigue/weakness, zero appetite, no strength to even open my eyes). That's not to say I haven't had those symptoms on flare days, because those all fall under the umbrella of symptoms of Lyme and multiple co-infections, but the days on which I've had the symptoms seem to have no direct correlation to the EBV treatment doses. Which is great news because it means we're getting closer to finishing this EBV treatment and moving onto the next culprit. Naturally, we've been really excited with what we think is marked improvement on the EBV side of things. You could even say I've been enjoying the view from one of the smaller hilltops on the roller coaster. Or at least I was until a few weeks ago, when I started what will end up being at least a 30-day course of diflucan to treat this systemic candida/yeast issue I've mentioned a lot the past few months. I'll say this much: detoxing from yeast is no joke. I thought I knew a little bit about how bad yeast detox can be after I had my first detox reactions when experimenting with the super strict anti-candida diet a few months ago, but I had no idea how intense yeast-related herxing can be. I took 6 days of the diflucan, and during those 6 days I not only experienced herxes that rivaled the EBV herxes as far as the fatigure/weakness/lack of energy goes, but I also had a resurgence of the constant severe abdominal pain I haven't had for several months, persistent nausea that no amount of detoxing (burbur, coffee enemas, activated charcoal, or anything else) could help, and that overall toxic, my-muscles-feel-like-they're-infused-with-lead feeling. Zero fun sir. But here's the thing: if you have an issue with systemic yeast, like so many of us with Lyme & Co's do, you HAVE to treat the yeast issue if you want any of the specific treatment for Lyme & Co's to be successful. It doesn't matter how many different treatment protocols you do for Lyme & Co's, if yeast overgrowth is an underlying issue for you, you'll miss out on a significant degree of healing/improvement/restoration of health until that is addressed. To avoid making this any longer than it already is, you can read a more in-depth description of yeast (and specifically, the anti-candida diet, although I'm really linking it because of the general info about yeast overgrowth) here. So even though yeast detox and herxing is BRUTAL ("with a capital [B] and that rhymes with P and that stands for Pool"....yes, I know the first letter in the actual lyric is T, hence my brackets, but if you've read my posts before you know I tend to insert lyrics/adapted lyrics in the middle of a sentence at least every other entry I post), I'm still going through with it. God is going to heal me, as I've said before, and I still have no doubt about that, but I know He led me to my doctor (who I've mentioned is a man of strong faith), and I know He's using my doctor to help facilitate my healing process, so I'm going to continue doing everything I can to follow the plans my doctor and I have discussed and decided are the best courses of action. And right now, that means finishing up round two of this EBV treatment and completing the remaining 24 days of diflucan (I took a break for a couple weeks because we had a couple appointments on the calendar that weren't able to be rescheduled) to treat this annoyingly persistent yeast problem, regardless of how bad I may feel while doing so. Most of you with Lyme totally understand the whole "you're gonna feel worse before you feel better" phenomenon, so you know where I'm coming from, and you know there's a lot of truth in that statement. But I like the definitiveness of the phrase "before you feel better"--it reaffirms, in my mind, that we all will feel better, eventually. We just have to stay on the roller coaster till the ride's over. Don&apos;t get freaked out by the title if you&apos;re one of the approximately 100% of Lyme & co fighters who is dealing/has ever dealt with candida overgrowth/systemic candida/candidaisis or any other systemic infection caused by Candida albicans, aka yeast gone wild. Heck, even just a few months ago, I wrote a couple posts praising the strict no-grains, no sugar (not even fruit) anti-candida diet, and I still do think that&apos;s a method whereby many people see huge advancements in their healing! But after following that diet with zero cheats for two months, I realized I actually wasn&apos;t feeling any different than before I started the ACD, meaning it wasn&apos;t working for me enough at that point in time to truly deliver benefits. And that&apos;s okay, it&apos;s all a learning process. So for a month and a half now, I&apos;ve abandoned the super strict ACD and allow myself low GI fruits I&apos;m able to tolerate in moderation, as well as adding back in grains such as brown rice, millet, etc. I&apos;m still following the Lyme diet and my personal guidelines due to food intolerances (gluten free, dairy free, egg free, refined sugar free, peanut free, yeast free--with the exception of nutritional yeast, corn free, etc), and I haven&apos;t noticed any flares that coincided with the reintroduction of any of these foods, so that just shows me that even though yeast is a huge issue for me (more on that in a later post), fixing it solely through diet wasn&apos;t the path for me at this point. We&apos;re all different, so if a strict anti-candida diet has worked for you, by all means, please do what your body responds to! But what does any of this have to do with the title? Well, it&apos;s easy to assume that if you&apos;ve got a systemic yeast problem, you should avoid all types of products with "yeast" in their name. I used to do this very thing, which, sad to say, resulted in me giving an entire bottle of unopened nutritional yeast away for free, because I didn&apos;t know there is a distinct difference between nutritional yeast and the yeasts that overpopulate our bodies. But guess what, guys? They are TOTALLY different. Yes, I am telling you nutritional yeast is okay to eat when you&apos;re fighting a systemic yeast (candida) infection, and I&apos;m also telling you it&apos;s super yummy. Like really, super yummy. On a yum scale of 1-yum, it scores infinity yum-factor. I&apos;m going to briefly list the many health benefits of the awesomeness that is nutritional yeast directly below, but following this list are a few points of clarification designed to put to ease any lingering doubts or questions you may have. Did I mention its awesome, cheesy/nutty taste? This nutrition label wins at life. Protein? Fiber? B12? Folic acid? All those other vitamins? Sign me up! And come on, especially if you&apos;re a vegetarian or vegan (like myself) adequate amounts of B12 and protein can be hard to come by--so start using nutritional yeast, and you&apos;re on the way to improving those necessary nutrients and minerals! Plus it just tastes so daggone good (much better than B12 and many protein supplements)! Now, for some basic facts about nutritional yeast--and why it&apos;s not only safe, but also an excellent idea to eat--I&apos;m sharing information below from bestnaturalfoods.com because they explain it fairly easily. "The yellow flakes of nutritional yeast are a pure strain of yeast called Saccharomyces cerevisiae. In the same family as edible mushrooms, yeast has been used in food and beverage production for more than 5,000 years. Today, the same strain is used to brew beer, make wine, and leaven breads as well as develop the nutritionally-rich food called nutritional yeast." "Each batch of nutritional yeast is grown on a mixture of cane and beet molasses for a period of seven days. B-vitamins are added during the process to provide the yeast with the nutrients it needs to grow. When harvested, the yeast is washed, pasteurized, and dried on roller drum dryers before it is ready for market. It is then used by food manufacturers in food products, added to boost the nutrient levels in pet foods, and simply packaged for sale in natural foods stores." "Unlike active baking yeast, nutritional yeast is grown solely for its nutritional value. It should not be confused with brewer’s yeast, a by-product of breweries and distilleries. nutritional yeast is a low-fat, low-sodium, kosher, non-GMO food that contains no added sugars or preservatives. The cane and beet molasses used in the growing process does not make nutritional yeast sweet and is not a source of simple sugars." 1. Nutritional yeast is safe for most people, even those who are struggling with candida, because it is not a strain of candida and is made inactive during the heating period of production. The one exception to consider is that if you have just begun your journey to heal from candida, your body may have the tendency to treat anything that remotely resembles any type of yeast as more of the same bad yeast, so be aware and play this by ear if you&apos;re daring enough to try it in those first stages. Of course you should always eat everything in moderation, as well as keep track of any negative reactions you may have to this or other foods. These are often signs your system cannot handle whatever the trigger food was. 2. Nutritional yeast is gluten free, vegan, kosher, non-GMO, sugar free, salt free, so can be eaten by a majority of people who follow any of these dietary lifestyles. But goodness gracious, EVERYONE could benefit from nutritional yeast, so don&apos;t be stingy--share the yum! 3. Nutritional yeast is an excellent source of B-vitamins, Folic acid, protein, and a whole host of other vitamins and minerals needed in our day to day lives. Thanks for reading! Hope those of you here in the US had a good Fourth of July yesterday!